(Nanowerk Spotlight) The blood-brain barrier (BBB) has the fundamental function to protect the brain from neurotoxic compounds, pathogens, and circulating blood cells. In order for nanomedicine applications to deliver a therapeutical compound from the blood system into the brain, this selective biological barrier has to be overcome. Crossing the BBB is the object of intensive research in nanotechnology and biomedicine for developing new therapies against brain cancer and for the treatment of neurodegenerative diseases. For this reason, it is extremely important to develop realistic models of the BBB, which mimic as most accurately as possible the in vivo environment. In the past, different BBB models have been proposed, from static 2D models, to 2D microfluidic systems, and, more recently, 3D systems. However, until now, the technological limitations of the available fabrication techniques did not allow the reproduction of the brain's microcapillaries at 1:1 scale. The development of high-resolution 3D-printing technologies has now enabled researchers to develop a realistic 3D bio-hybrid microfluidic model of BBB inspired by the in vivo neurovasculature. 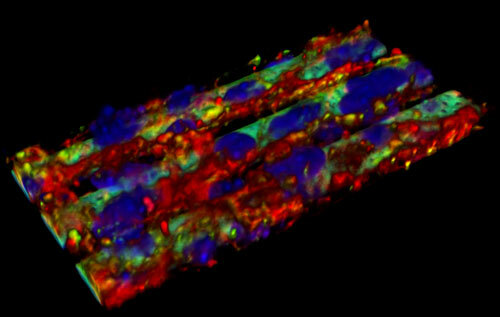 In new work published in Small ("A 3D Real-Scale, Biomimetic, and Biohybrid Model of the Blood-Brain Barrier Fabricated through Two-Photon Lithography"), researchers in Italy have, for the first time, faithfully reproduced the microcapillaries of the neurovascular system on a 1:1 scale. Moreover, they have developed an accurate mathematical model that was fundamental both for the design of the bio-hybrid device and for the characterization of its fluid-dynamic properties. This model will continue to be useful for evolving and refining the prototype design. "The bio-hybrid BBB developed in our laboratories allows to carry out high-throughput screening of different drugs/compounds/nanovectors, and to evaluate their ability to cross the BBB," says Gianni Ciofani, an Associate Professor at Polytechnic University of Torino and the Principal Investigator of the Smart Bio-Interfaces group at the Italian Institute of Technology. "Furthermore, our bio-hybrid platform allows to rigorously study the BBB crossing by avoiding the use of animal models, thus overcoming the issues related to the scarce accessibility of the brain and limiting important ethical concerns." In this model, the brain's microcapillaries are characterized by both an artificial and a biological component, and are therefore defined as bio-hybrid. Specifically, the artificial structure consists of 3D porous tubes with the typical diameter size of brain microcapillaries (about 10 µm) and is fabricated by using a high-resolution 3D-printing technology: two-photon lithography. 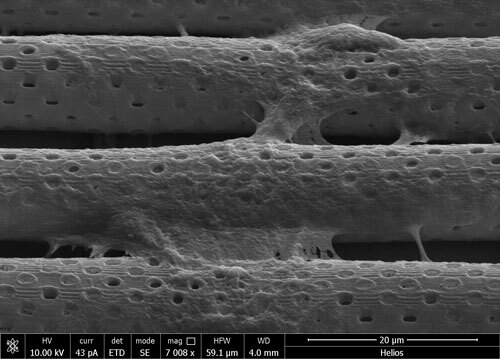 The printed porous microtubes provide a scaffold for the growth of endothelial cells, which externally envelop the tubular structures, thus developing a biological barrier. This barrier, similarly to the BBB, separates a luminal compartment (inside the artificial blood vessel) from the external abluminal region (represented by the brain). Finally, in order to further mimic the in vivo conditions, the flow rate of the solution inside the luminal bio-hybrid microvessels is set to a value comparable to that of brain microcapillaries (1 mm s-1 average speed). 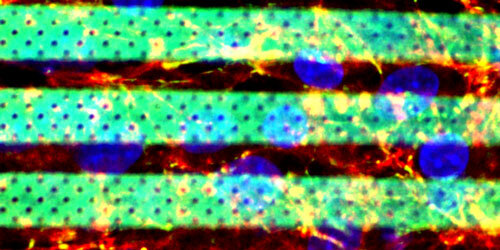 "The novelty of our work mainly consists in the fabrication of a reliable platform to carry out high-throughput quantitative investigations of drug delivery to the brain," Ciofani tells Nanowerk. "The in vitro model provides a closed system where the different variables such as drug concentration, blood flow speed, pH, and temperature can be easily tuned and monitored, thus providing precious and detailed information about the BBB crossing in real time and at cellular/subcellular level." Although several recently developed drug compounds show great potential for the treatment of brain diseases, most of them cannot be used in a clinical environment because they are unable to cross the BBB. One specific problem consists of the identification of the different bio-chemical mechanisms involved in the BBB crossing of specific substances/molecules. Some of these pathways have already been discovered, but faithful and reliable BBB models will allow researchers to further investigate these mechanisms at subcellular resolution and in real-time. The ultimate goal of this work (which has been performed in the framework of the ERC Starting Grant 709613 SLaMM. This project has received funding from the European Research Council (ERC) under the European Union's Horizon 2020 research and innovation program, grant agreement Nº709613, SLaMM) is to modify, i.e. functionalize, anticancer nanovectors in such a way that they can cross the BBB through the blood system and target diseased tissues in the brain. The development of innovative treatments to treat brain diseases represents an important market for pharmaceutical companies and a huge scientific/technological challenge involving both public and private research centers. Since the accessibility of central nervous system is extremely limited, the possibility to exploit a reliable platform to test the BBB crossing of new drugs/compounds open up new frontiers for the brain therapy. "Our platform can be adopted to test drug delivery to the brain for the treatment of many diseases characterized by an impairment of the neurovasculature, for example cancer, stroke, Alzheimer's and Parkinson's disease," Ciofani points out. "For these specific applications, the architecture of brain microvasculature in physiologic and pathologic condition will be reconstructed by using a reverse engineering approach and different drugs/treatment can then be tested." Going forward, the team will dedicate future studies to test the BBB crossing of a variety of different drugs/smart nanoparticles/anticancer agents. Moreover, they will functionalize these drugs/nanovectors with different ligands in order to promote their delivery through the BBB and their selective targeting to specific cell types such as cancer cells. "We strongly believe that nanotechnology-based solutions such as nanocarriers and nanovectors for theranostic applications show enormous potential for the treatment of brain pathologies," Ciofani notes. "However, in order to achieve a realistic implementation of nanomaterials into the clinical practice, it is extremely important to address safety issues. Since most nanomaterials also accumulate in peripheral body regions – e.g., spleen, liver and kidney – it is of extreme importance that such nanovectors release the drugs/compounds only in the brain, and, specifically, in the region of the diseased tissue." "In this context, the new generation of remotely triggered smart nanomaterials represents, in our opinion, the future solution for the treatment of brain diseases. The BBB model we developed represents a powerful testing tool to achieve these goals," he concludes.